Bunco Score Cards ... Bunco Tally Cards ... come in units of 12 for your Party ... Bunco. 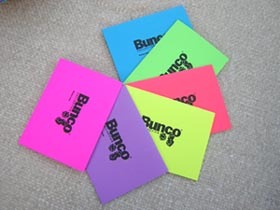 These Bunco score cards are a must for your Bunco night. Available in fuchsia, red, blue, lime green, purple, and yellow. The Bunco enthusiasts keep her personal score, Bunco's won, and her wins or lost scores for the night. Folded cards keep the secret of your wins or lost scores until the end of the night ... when ... the scores are tallied and the final scores are revealed. Keep your Bunco scores a secret until you want to reveal your score with these unique folded Bunco Score Cards. Call these score sheets, scorecards, points, but use them at your Bunco Night Party Bunco Party. If your theme for your Bunco Night is the assorted paper supplies please note these official score cards may be purchased in solid colors for your perfect theme. Free shipping. Bunco Score Pads also available.